These deserve 100 stars! Recommended ALL the way. So, I used boneless pork country style ribs, and they turned out very much like pulled pork. I boiled these with the seasoning for one hour. 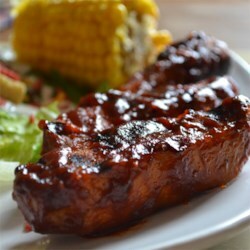 During that time I prepared my own BBQ Sauce (5 tbs ketchup, 5 tbs brown sugar, 2 tbs vinegar, 1 tbs lemon juice, 2 Worcestershire sauce, 1 teaspoon: salt, dry mustard powder and chili powder) After mixing it together and heating it up for a bit, I poured it over the ribs, and baked it for 1 & 1/2 hours. It makes them very sweet and juicy. I will make again and again! Thank you!